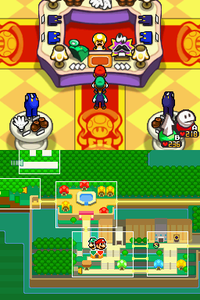 Toad Town Mall is the main shopping mall during the events of Mario & Luigi: Bowser's Inside Story. The mall can be found on the south side of Toad Town. The first part of the mall when first encountered is the west side. On the west side, there are the three gear stores that sell Mario and Luigi vital clothing. The first is the Gear Shop, which is seen in the bottom section of the west side in the green-colored mushroom-shaped building. Toadles Boutique is the second one found in the middle of the west side, recongnizable by the brown color. The final gear shop is available is the Star Shop, found in the upper section, recongizable by the white exterior. There is also a Tea Kiosk selling Mushroom Tea in the bottom left corner of the west part, as well as a pipe leading into Toad Town caves. There is also a yellow-and-brown-spotted Toad in the upper left corner that runs the Mushroom Ball Derby. Although all sixteen Mushroom Balls are hidden on both sides of the mall, the brothers must bring it to him on the west side to claim the prizes inside. The second half of the mall lies within the east section of south Toad town. Found there is the Item Shop, which sells Mario and Luigi valuable items. It is located on the bottom right side of the east section, noticeable by its blue-tinted mushroom-designed exterior. Next to it to the left is the Badge Shop, which is the only store that sells the bros. all the purchasable Badges. In the top sector of the east side is the Toadley Clinic, where all ill Toads can be cured. This is also where the Mario Bros. fight Bowser and meet with Dr. Toadley in order to stop the blorbs. Later in the game, the clinic is the birthplace of the Miracle Cure, which goes around the mall and the rest of Toad Town and cures all the Toads. In the top right corner, near an exit to the mall is a yellow pipe that will lead back into Bowser's body. There is also a young blue Toad that will play hide-n-sneak with Mario and Luigi. He can be found in front of the badge shop complaining about his parents always being shopping. He will hide in various places - such as behind some blorb-infected Toads or inside some shops - but will end back on the east side. Once Mario and Luigi find him in all his hiding places, he will give the brothers the Small Shell for playing with him. Toad Town Mall is the only place in the game where certain ranks are required to access certain stores. This page was last edited on October 6, 2018, at 10:25.